Use the electric water heater troubleshooting guide to find the reasons why an electric tank-type unit fails, why it is not working, there is no hot water, not enough hot water (slow recovery), water is too hot and why the reset button or breaker trips. The troubleshooting guide helps you find the answers about failures of the heating elements, thermostats, and other parts. The article will cover problems and causes that are specific for electric units only, while problems such as corrosion, leaking, smelly water, noise, which are common on both electric and gas units, are described in this troubleshooting article. In this guide it will be assumed that the unit was properly sized, installed professionally, per codes and manufacturer instructions. Note: If your water heater doesn't work, needs repair, service, replacement or professional installation always contact a licensed plumber. Whatever you do, checking, testing, repairing, even maintenance, shut off the power to the water heater by turning off the corresponding breaker on the electric panel. Tip: Use the non-contact voltage tester to ensure that there is no power on the unit. If the upper heating element is burned out, replace it. How to check if the heating element is working or not? Use this guide to test an element. Test the thermostat to see is it broken or out of calibration and replace it if needed. Inspect the fuse and replace it if it is blown. Check the voltage of the heating elements and thermostats and see if there is a short circuit, especially after the lighting or power outage. If the high limit switch (ECO) has tripped you have to reset it manually. Check out why the reset button keeps tripping and how to reset it here. If the water is leaking around the heating element, tighten the element or replace the gasket. If there is a loose wiring connection, tighten it. Clean the connection that has the build-up accumulation during the oxidation. If the thermostat is set too low, increase the temperature, but be careful of the scalding temperatures. The recommended temperature is in a range from 120 F to 125 F for warm water or 140 F for bathroom and kitchen applications. Replace the lower thermostat or a heating element if you find them faulty. When checking the heating elements, see are they covered with the lime scale and sediment build-up. Clean the deposits to increase performance and efficiency. Tighten the loose wiring and fix if the ground is poor. If the piping line is too long and exposed to the cold weather, make sure to insulate them. If the dip tube is broken, replace it. Hot water is diluted by the cold water too early. If your hot water faucet, drain or any other connection leaks, fix it. If the thermostat is not flush with the heater's body make the adjustment so it is perfectly in contact. The following steps in the electric water heater troubleshooting will bring the energy consumption down and save you on energy bills. If the thermostat is set too high, lower the setting to 140 F, or to avoid scalding temperature, around 120 F (which is factory set). The thermostat is faulty or out of calibration. Make sure that this element is in contact with and flush to a tank. Thermostats and heating elements are not covered with the insulation. The TPR valve should be operational, if not installed a new one. The grounded element (short circuit to the ground) will cause the heating element to be in constant operation, which will activate an ECO in the thermostat or overheat the water. If there is a wrong wiring connection at the heater's terminal, correct it according to the manufacturer instructions. Check the fuse, thermostat and heating elements for the voltage. They might get burnt during the extreme weather conditions, lighting and during the power outage. Correct the loose wiring and short circuit. Dry firing is the common cause of the heating element failure. The elements should always be fully submerged in water. Sometimes the sediment build-up around the heating element will cause the sizzling noise while the air-pockets will result in the dry fired element. One of the main reasons why the reset button is tripping is because the water inside the tank is too hot. When the thermostat goes bad, it actually gets stuck in ON position, making the heating elements heat the water non-stop, increasing the water temperature and causing the reset button to trip. Also, the heating element can have a short and continue heating, even after the thermostat shuts off the power, tripping the switch. A loose wire can also be the cause of the problem no matter is the temperature high or not, so as the bad reset button. The most common solution for all these problems will require either to replace the bad element or tighten the loose wires. Note: If the reset button and circuit breaker continue tripping, a more serious problem might occur, which would require professional help. The screw-in type of the heating element screws into the tank and has two wire terminals. This is where the element often fails. And when it fails you could often see either black and burnt spots. In order to access the heating elements and thermostats, you have to remove an access cover, fold back insulation and remove the plastic protector. Use the heating element wrench to remove the part. Check out this article to learn how to test and remove a heating element. For easier understanding and successful repair, it is important to know how does the electric water heater work and what are the main components. The conventional, tank-type electric water heater with the storage tank uses electric heating elements (one or two) to heat the water that is stored inside the tank. These are immersion type elements providing efficiency up to 99%. The cold water that is stored inside the tank is delivered through the dip tube. When the power is turned on, the upper element is energized heating the water at the top of the tank. Once the water is heated to the set temperature on the thermostat, the power is switched to the lower element heating water until the temperature in the lower part of the tank reaches the set one on the lower thermostat. The hot water is drawn from the top and moved through the outlet hot water extension to the tap, shower or any other application. At the same time, the dip tube delivers cold water to the bottom of the tank, where it mixes with the hot, lowering its temperature. As the water gets colder, and the temperature goes below the set one, the bottom heating element turns on again (upper can too). If the upper element burns out the heater will stop operating properly as its thermostat will never be satisfied and the lower element won’t be able to engage. If the inside water temperature is too high (170 F), the red reset button which is found on the upper thermostat will trip. It can be reset it by pressing it. Every metal tank has the lining to protect it from corrosion, including the anode rod which does the same. Each heating element has its own thermostat which allows electrical current to reach the element and heat. There are different types of elements which also come with different wattages. At the bottom of the tank, there is a drain valve, to drain or flush the tank, while at the top of the unit, the TPR valve, as the safety element, prevents and protects the unit from extreme pressure and temperature. When talking about the electric water heater troubleshooting you will notice that there is often a number of different causes for one problem and the same symptoms for different problems. This is why you should troubleshoot the electric water heater by taking into account all the symptoms and causes and consult the unit's manual and codes. 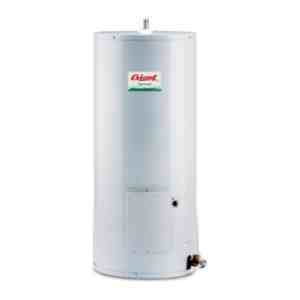 Or, contact a licensed plumber to help you repair the water heater. When replacing the faulty elements try to buy genuine parts and match the characteristics. If the inspection and maintenance are done periodically and per manufacturer's instructions, you will reduce the danger of heater's failure and problems with the water heating.